Written to help children understand why some kids get new foster parents or new adopted moms and dads, with resources for adults. 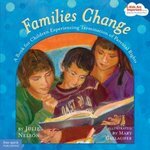 Nelson, Julie, "Families Change: A Book for Children Experiencing Termination of Parental Rights" (2007). DIVerse Families. 108.